Global Fashion Collective showcased at New York Fashion Week for FW19, presenting 3 distinct runway shows. First up, 2 collective shows with 6 unique brands, bringing expressive colour palettes, artistic fabric manipulations, and vintage influences to the runway. First up, Canadian brand FAUN by Marisa P. Clark, brought a collection of elegance and subtlety to the runway, as an ode to the timeless, sophistication of New York City Style, referencing icons Audrey Hepburn and Blair Waldorf. Rich jewel toned fabrics, with elegant necklines and fluttering hems, effortlessly complemented intricate handcrafted pieces, such as pearl bralettes and opera glasses. Models carrying bunches of Baby’s Breath flowers stayed true to FAUN’s signature whimsical, feminine style. A highlight piece - a colour blocked suede jacket in pink with yellow contrast. Thick structured leather, glistening silks, and opaque organza gave texture to an artistic collection by Canadian designer Kirsten Ley. ‘NAISSANCE’, representing the birth, or ‘rebirth,’ of her label as an official Parisian fashion house gave life to classical French couture techniques while maintaining modern, avant-garde silhouettes. The colour palette featured deep metallic blue with Ley’s signature crisp oxblood softened by whimsical sheer creams, manifesting the emotional dichotomy of a fragmented human psyche. Kirsten’s signature sculpting technique can be seen in a deep purple leather skirt worn with an asymmetric top with layered, gathered organza. Iridescent fabrics add shadow and light, evoking a romantic escapism for the viewer. With a fresh take on tradition, Chinese brand ERXI X MRHUA MRSHUA presented a quirky unisex collection for FW19, with the cutest mini model leading the show. ‘Silk Road, Beijing Beijing’. told a story with ornate embroidery of traditional Chinese New Year symbols, and a vibrant colour palette of lemon yellow, silver, red and candy pink. Striking patent boots, bobble hat caps, exaggerated ruffles, and quilted fabrics added a modern and unique twist. Designer NiuNiu Chou’s statement eccentricity at its finest. To close the show, Canadian brand M.E. presented a collection of unique femininity in a selective black & white colour palette. Designer Michelle Elizabeth was inspired by Fashion in its highest state as the ability to present oneself, as a consciously constructed representation of who we are. A full length off-the-shoulder dress with an opaque layer over a digital print with the words ‘Art should comfort the disturbed and disturb the comfortable’ made a statement. Silky fabrics with inky prints in beige tied the collection together, with silver hook and eye fastenings at the neckline and cuffs beautifully catching the light. 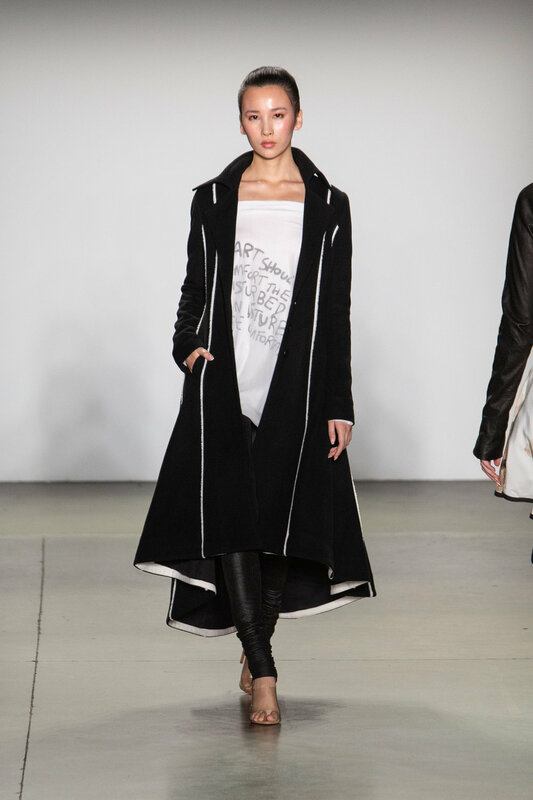 A highlight look was a black long-length winter coat with white edging to panels, fitting beautifully at the waist in a flattering cut. The second presentation of Global Fashion Collective put the spotlight on exquisite elegant tailoring; the designers bringing forth an haute couture feel to the runway with careful craftsmanship and vintage influences. Designer Tong Li for China based brand HIGHTLI was inspired by the video game ‘The Legend of Zelda’ in creating her FW19 collection ‘Melody’. The designs work as a ‘composed song’ that coordinate relevant yet differentiated elements in an unconventional manner. A caramel coloured silk shirt with flared cuffs, and high-waisted pants that cinched in the waist, gave a structured feminine look. Fabrics in herringbone, checks, and dogtooth added texture, and a cozy bold red fur coat created volume with oversized sleeves. A deep burgundy cage-like structured button up cape worn over a silver silk two-piece with bird-cage motif formed a key look. 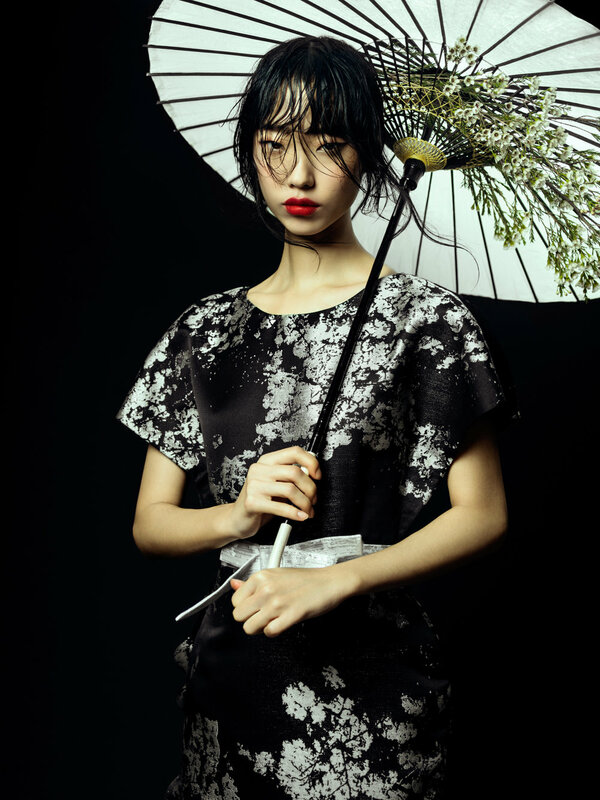 Chinese brand Queenie Zoe by Bomin Kim was inspired by Samiljeol (Independence Movement Day in Korea) and the start of modernization for Korean women. Creative director Bomin Kim has designed a series of gowns in a bold, feminine style. With references to traditional late 19th century silhouettes, elaborate empire line dresses with ruffled tiered godets and leg of mutton sleeves gave a sense of grandeur. Fur trims and large flouncy bows adorned the collection, and a velvet dress with exaggerated pointed collar brought beautiful contrast in black and white. 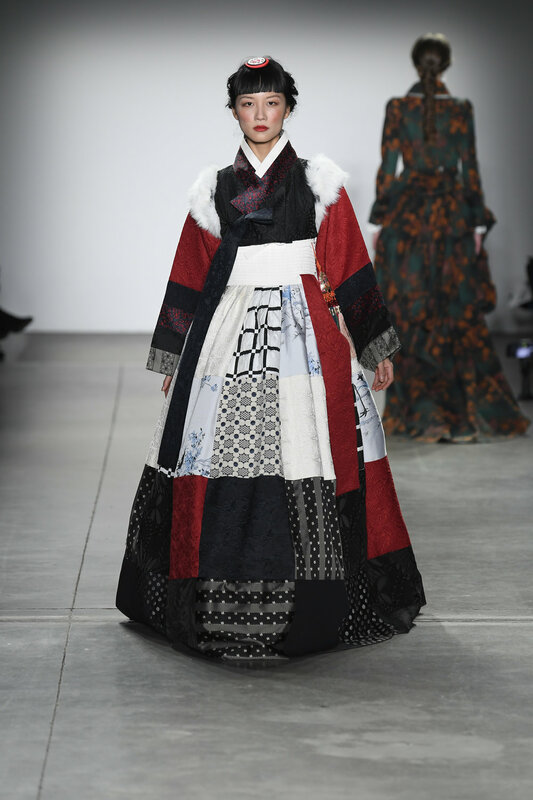 The finale look incorporated a traditional Hanbok style dress with large oversized sleeves and patchwork fabrics. Global Fashion Collective is a platform supporting creative designers from all around the world. The collective produces runway showcases in different fashion capitals with the aim to accelerate the designer’s global development, increase their international media visibility, and open new markets. By presenting its designers in front of international media and buyers globally, Global Fashion Collective is an expansion of Vancouver Fashion Week. Stay tuned for our next post on SUNCUN, the 3rd GFC showcase at NYFW this season. PHUONG MY is a luxury line of designer Phuong My. 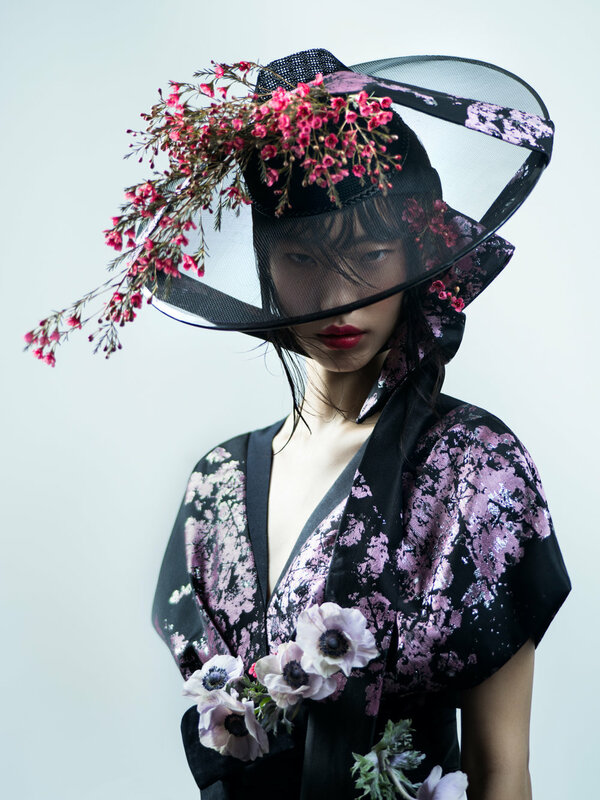 Each season, PHUONG MY presents new collection dedicated to separate themes honoring the Oriental beauty of Asian women - who are known for their talent, enthusiasm, feminine beauty, subtlety but also strong will. Designer Phuong My is well-known for her signature silhouette featuring hour glass, cocoon shape in the lower parts of dresses that highlight the beauty of women’s shape. Luxury materials are hand -selected from prestigious textile mills in HongKong, Tokyo, Milan and Paris to ensure the highest quality and perfection. MM: Can you describe your creative process? Where do you find inspiration in your day-to-day life? Imagining women as a canvas and their deeply-rooted characteristics as water colors, Phuong My painted women by their femininity, delicacy and charm. These influences came from her childhood memories living in the gracious life of grandmother and mother. She was taught to exemplify perfect etiquette in every occasion; to dress and carry herself with dignity; and to speak eloquently in conversation. She grew up to become a woman of grace. When it comes to evening dresses and formal gowns, Phuong My understands essential elements that make women shine in her special moments. She draws inspirations from graceful women around her to create designs that exude the hidden charm of women. The signature silhouettes of Phuong My are wasp waist that accentuates women’s hour glass figure with cocoon shape in the lower parts of dresses. This concept is inspired by the beliefs and ideologies of beauty in the East world; women should have a small waist and a back that is as smooth as pearls. Mastering the language of fashion design, Phuong My is a true artist; she visualises her signature silhouettes that help sculpt the body of women in unique artistic forms and exquisite shapes that describe both soft and strong side of women. An infinite quest of perfection is reflected in Phuong My’s attention to details throughout her designs. With flowers as symbols of feminine beauty, dresses are adorned with flower-inspired details to give intricate touches. This appears in collars as well as decorative details made by satin, beads, Swarovski crystals or feathers. There are more than 70 artisans from famous fashion studios were hand-selected by Phuong My to work on specific pattern design. What does the PHUONG MY women like to wear/ see this season. I belive each collection we are telling a story, a concept behind the brand. At the end of the day, our customers come to us to buy a lifestyle, a story, not just a piece of clothings. MM: How has your work evolved since you began your own label? I understand more of my customers, of who will wear the designs I draw, of who they are and what they look for. The work reflect the women of PHUONG MY brand. MM: How do you find working as a designer in Vietnam? Has the culture/surroundings affected your design aesthetic? Do you feel connected to your home? I travel very often and do not stay in one place. I believe today world is global and connected. To be a designer in Vietnam is the same as being a designer anywhere else in the world. You get access to the same information, the same resources. However, my designs are deeply influenced by the Asian Culture –the Oriental beauty. Our greatest inspiration comes from the exquisite virtue of Asian women, who are at the same time fervent and feminine, bold and delicate. Behind their dainty grace, lies brilliant compassion and admirable strength. With beautiful, striking silhouettes clothed in the most exclusive luxury fabrics, designs of Phuong My embrace the feminine figure of the Orient. By being in it, be a part of it everyday. To have a fashion company and to be able to sustain the company, 90% of the time I must learn how to do business, how to balance number, finance, manage people, production, etc. Only 10% of the time I get to truly be a designer and design. It is still my favorite part of the job. When I get to design, I truly am happy and live in that moment. MM: What is the inspiration behind your S/S19 collection to be showcased at Vancouver Fashion Week? This season, we take inspiration from sounds and color. The contrast between the smallest sound to the deepest, the slow note to the fast emotional beat. The solid dark color with a hint of light. We called this collection Sonorous. Follow Phuong My on Instagram @phuong_my and check out the website here. This years theme, "Heavenly Bodies: Fashion and the Catholic Imagination" spoke directly to my heart. As someone with a soft spot for Latin Catholicism (we can thank my Peruvian heritage for that) and a deep appreciation for Renaissance art, I was born ready for this theme. We talk inspiration, design identity, and FABRICS with U.S DESIGNER Barbara Riordan ahead of her Vancouver Fashion Week showcase. MM: Can you explain your brand and yourself in a few sentences? Riordan: I am Pariah, everything I create is something I want to wear. I have always had a strong fashion aesthetic. I've had friends tell me they couldn't wait to see what I was going to wear, even just at everyday get-togethers. I wasn't 'trying', I was just wearing my clothes. Pariah is an insiders brand, for the woman who chooses a unique fashion voice. Each piece is limited edition. MM: What sparked your interest in fashion? Riordan: I have always been interested in fashion. I've been making my own clothes since I was 6 years old so I was never bound by what was available in stores, I created my own looks. I feel that a fashion sense is really something a person is born with. MM: Your work is very experimental. Are you always investigating something when you create? Riordan: I have two methods in my creative process. If I am going on a trip or have an event to attend, I start coming up with ideas of what I would want to wear. How am I going to stand out? If I am going to a formal event where I think others will be wearing black, I will make a pink floral gown. The other method for creating is when I go to the textile shows. Fabrics with colour, print or texture attract me. The fabric tells me what it wants to be; a skirt, a blouse. The fabric speaks to me. Riordan: A lot of my inspiration comes from the decades I have experienced. A pop of colour that reminds me of the 60's. A neckline that I wore in the 70's. I'm not reinventing the wheel but I am trying to make it more interesting, more fun. Let's face it, a woman's body hasn't changed from its basic form since Eve. A waist, a bustline, hips. I want to flatter the female body, accentuate the waist, revel in the femaleness. MM: Here at MM we are very interested in design identity as we talk to designers from all over the world. How has the U.S design scene influenced you? Can you see any cultural influences being based in Indianapolis? Riordan: I think being based in Indianapolis in the midwest, has allowed my love of outerwear to grow. We have weather of all extremes here. My statement trench coats give women a way to show their personality even on gloomy days. She can walk down the street wearing a Pariah limited edition trench and she can show her strength, her uniqueness. I'm sure the people of Vancouver can appreciate a great trench coat! MM: Where do you source your fabrics? Riordan: I source my fabrics at textile shows. I go to the big ones in NYC. I have a couple of fabric reps in Chicago I use as well. MM: Have you found beauty in unexpected places/situations? Riordan: I like surprises. In some of my creations, there is a reveal, as you will see. From a distance a skirt or a coat may look like a colourful print, but on closer inspection, it's got chickens on it or the design is comprised of insects. MM: Can you explain the inspiration behind the F/W18 collection you will be showing at VFW in March? Riordan: My inspiration for F/W18 is just more of what I want to wear! I want one of each item in my own closet. Thank you for giving us an insight into your creative design practises. Catch Pariah's showcase at Vancouver Fashion Week next month. Interview with NYC based designer Qiongxin Kou. MM: As a designer in New York, the city that never sleeps, is there a strong feeling of being under pressure? Do you feel the push and pull? Qiongxin: Yes, I do, but I feel a positive push to let myself grow faster and be more efficient to achieve my goals. I like being put under a bit of pressure when I need to be in a work mood. MM: How are you influenced by your Chinese heritage? Can you explain the Chinese school of thought which you apply in your life? Qiongxin: Mentally, Chinese culture and thoughts tend toward being gentle and being humble. There is one philosophy in China called ‘Overcoming hardness with softness’, which means you don’t have to use a hard attitude to conquer a hard thing; a soft method could work out with a better result. I love and believe in this philosophy so much, and growing under this gentle heritage I do everything with a peaceful and calm heart. I feel comfortable, powerful, and more efficient in achieving the best outcome by working in this way, especially in design. My design work is always in a fresh style, the colour palette is not aggressive but bright to give an eye-catching visual effect. The construction, cut, and materials of my design pieces are not angled and hard, but simple and soft, which give wearers a more comfortable and cozy experience, and this ‘cozy wearing experience’ means everything to me in producing designs. MM: This philosophy is reflected in the soft knitted pieces of your work. Does your mood/feelings influence your design process? Qiongxin: Yes, this is why I love haute couture techniques and try to incorporate hand-making skills in every collection. I love how delicate and original those hand stitches look on garments. Only a person who is in a peaceful and calm mood could bring that delicate beauty and quality look to life, it doesn’t matter with how simple or complicated the techniques. I love to deliver a very comfortable and wholesome wearing experience to my customers, so not only do I work in a soft mood but also choose soft fabrics and materials to complete my designs. "I love and believe in this philosophy so much, and growing under this gentle heritage I do everything with a peaceful and calm heart..."
MM: Can you describe the 'Bamboo Culture' collection that we see here? Qiongxin: Bamboo Culture is inspired by the physiques of bamboo which embody the values appreciated by the underlying philosophies of Chinese culture - Confucianism, Taoism, and Buddhism. Of the three, Confucianism teaches humanism, virtue, and self-behaviour; Taoism conveys harmony in nature and its ability to restore balance; Buddhism preaches karma and self-control. The three different schools share many common values, one of which is the fundamental belief of bamboo culture: self-actualisation through adequate reflection upon oneself and one’s relation to society and nature. Inspired by Bamboo Culture, I want to create a slow design system that balances the industry and the environment around it. Beginning with using a zero-waste design process and sustainable materials, I increased the longevity of a garment while decreasing its eco-footprint. Every piece was finished by hand; I work closely with craftsmen to develop innovative methods of construction, fabrication, and treatment. MM: As a creative practitioner, does being part of the slow fashion movement help you to be more mindful? How have you embraced sustainability into your design process? Qiongxin: Yes, it helps, because if I choose to be part of slow fashion, I will be responsible not only for a more sustainable design process, but also in promoting cultural traditions that offer a social function. For example, in China, we have 56 ethnic groups, and in each group, they have their special traditional handcraft, such as natural dyeing, hand embroidery, weaving and so on. So, if I use one hand-making technique in my design, my work not only delivers the aesthetic but showcases my beautiful culture to the world. Also through careful selection of methods in how I approach the production of my designs, I exclude many factors that have been harmful, superficial and wasteful, so the wearer can be free from these negativities, resulting in real responsible designs that will last. MM: Is self-awareness important to you? To feel well- grounded and strong in both yourself and your role as creator? Does designing deepen your knowledge about yourself? Qiongxin: Yes, of course. Self–awareness is very important to me. This lets me know who I really am; why I make every decision; how I communicate with myself and others ; and my living value in the world. Having clear self-awareness could help everyone see what is right, like if a person deeply knows themselves they would know how to act appropriately, and automatically care for the living environment, and would not need to be told by anyone else to protect the earth because it is a very good thing. MM: What feeds your soul? Qiongxin: My lovely growing environment and childhood built by my parents, this is the key reason to why I am 'me' right now, and why I think, talk, and communicate with the world this way. I feel so grateful for being their child, because my sincere, brave, and positive attitude along with my values were fostered from them. Thank you Qiongxin for giving us an insight into your world and your softness philosophy. MM readers, what do you think? What feeds your soul?